New records obtained by NBC 5 Investigates show a 103-percent increase in crashes reported to the state involving buses with Dallas County Schools in just one year. 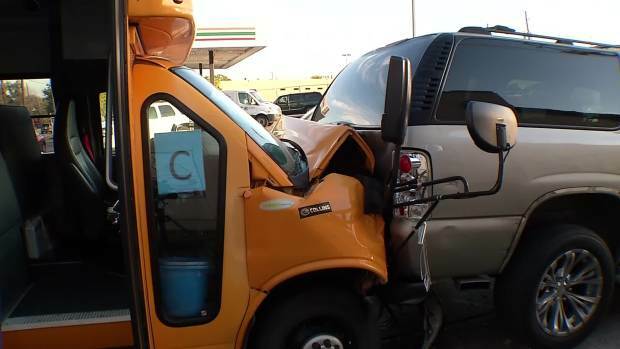 Documents from the Texas Education Agency and the 11 school districts DCS serves show DCS school buses were involved in 200 crashes in the 2014-15 school year and 405 crashes in the 2015-16 school year. The records also show that since 2009 at least 86 students have been hurt in DCS bus crashes. Because the buses are so big, children are fortunately often protected in crashes. In October Dallas County Schools fired 13 bus drivers and suspended another 229 after NBC 5 Investigates uncovered hundreds of traffic violations totaling more than $80,000. DCS used taxpayer funds to pay the tickets and did not discipline the drivers involved until NBC 5 flagged it. “Buses are big pieces of equipment that can obviously do a lot of damage,” said Coppell resident Todd Dillenbeck. Dillenbeck witnessed a bus crash in March where a DCS driver lost control of the steering wheel while making a left-hand turn and crashed into a traffic light pole. “The bus came across and took the entire light out,” said Dillenbeck. The driver, who was on her way to pick kids up from a nearby school, was pinned inside the bus after the crash. Fortunately, no students were on board at the time of the crash. But crashes and those running red light videos have Dillenbeck wondering what’s happening at DCS? “I want the drivers to be safe. I want my kids to be safe,” said Dillenbeck. The man in charge of safety at DCS blames the increase in crashes on a growing bus fleet, heavier traffic and the state reporting requirements that make even some minor crashes reportable if there are students on board. DCS said its drivers meet monthly to talk about safety, and the agency investigates crashes looking for ways to prevent them. Ray Lanoux, director of Risk and Emergency Management with Dallas County Schools, told NBC 5 Investigates, “if everything was static, if we didn't have an increase in our fleet, if we weren't driving more mileage, if the conditions of the community stayed the same,” then the trend would indicate crash numbers were decreasing. Experts told NBC 5 Investigates even in growing cities with heavy traffic, bus company managers can drive down the number of crashes. “Leadership carries all the responsibility in my opinion,” said Jeff Cassell, president of School Bus Safety Company. Cassell was head of safety at one of the nation’s biggest school bus companies for more than 20 years. He currently runs the School Bus Safety Company, which creates and sells driver training programs used by thousands of bus companies nationwide. “You see accidents go up. Right away, it’s a trigger. I mean, why? What's going on? What are we doing wrong? What's the behaviors that are leading to it? And you take appropriate action, you don't just document it,” said Cassell. Cassell says it’s up to management to teach drivers 15 key behaviors that prevent crashes and when drivers crash, or run red lights, he said managers need to retrain and discipline. “You can shape their behavior. We call it ‘setting norms.’ We want to set the norms where people automatically do it right the first time, every time,” said Cassell. But a new database obtained from DCS raises more questions about how well management is policing bad driving. It shows DCS has received more than 4,000 phone complaints about its drivers in less than two years – including more than 1,700 for reckless driving. The records show only one of those drivers was fired and 14 were suspended out of those more than 4,000 complaints. DCS says the other complaints were investigated but found to have no merit. “We absolutely have to have this service corrected,” said Dan Micciche, Dallas Independent School District board president. Micciche said his district will find another bus company if complaints and crashes don’t come down. NBC 5 Investigates showed him records that detail how crashes involving DCS transporting Dallas ISD kids are up 237 percent compared to five years ago. DCS insists it’s constantly working to reduce crashes and unsafe driving but claims sometimes crashes are beyond their control. “Given the conditions that lead to accidents – and we're out on the roadway with other parties involved – if it was just us and there were no other vehicles on the roadway … anyone could manage the conditions much better,” Lanoux said, saying that if it were only bus drivers on the road there would be no crashes. NBC 5 Investigates obtained data from the Texas Education Agency and the 11 school districts Dallas County Schools serves. TEA uses an annual survey to collect information on accidents involving school buses operated or contracted for use by school districts and charter schools, as required by statute and rule. Using that data, NBC 5 Investigates created these graphs showing the number of crashes reported to the state since 2009. *Richardson ISD says DCS is in the process of trying to revise the 81 number they originally provided the district for 2015-16 down to 23, based on a re-evaluation of their data and the state reporting requirements. In addition, DeSoto ISD did not provide data for the 2014-15 school year and Aledo ISD didn’t report for the 2009-10 school year. If you have questions about this data please email investigate@nbcdfw.com.